Every winter I am consumed with a burning desire to knit Bubs an entire wardrobe of fluffy jumpers, cozy cardigans, cute hats and little socks. We’ll just skip over the fact that I’m not the fastest knitter on the planet and the amount of free time I have in which to knit amounts to half an hour a day at best. What better way could there be for a knitterly mum to show her love than by covering her offspring from head to foot in handknit woolies? The urge always starts in October when I begin to harbour dreams of making an enormous Deramores order despite having enough yarn to knit onesies for a horde of zombies should the apocalypse come. I spend every waking moment browsing Ravelry in search of the perfect patterns and… that’s where my dreams come crashing back to reality. You see Bubs is a bit, shall we say, obstinate unreasonable fussy about her clothes. She doesn’t like long sleeves, won’t keep socks on for more than five minutes and refuses to wear anything that she deems to be “too tight”, although I’ve yet to determine what criteria she uses to make this decision as it changes on the hour. She once complained that the rain cover on the buggy was too tight! The only garment I can knit that she will wear without complaint are hats but while Bubs might sometimes resemble a Hydra in temperament she really only has the one head and can only wear one hat at a time, believe me she’s tried. I had all but abandoned hope when I came across a pattern for a capelet in the December 2014 issue of Woman’s Weekly Knitting magazine. It looked snuggly and warm, had no sleeves, couldn’t conceivably be considered tight and, more importantly, Bubs took one look and asked if I was going to make her one. A rummage in my stash unearthed enough aran yarn to knit it in size 4-6 years and it was an acceptable colour. Oh yes, I should also mention that Bubs is picky about the colour of her clothes too. Here’s the technical bit. The pattern is Sirdar 2364. I used 9 balls of Debbie Bliss Rialto Aran and had to increase my needles sizes to 5mm and 6mm. 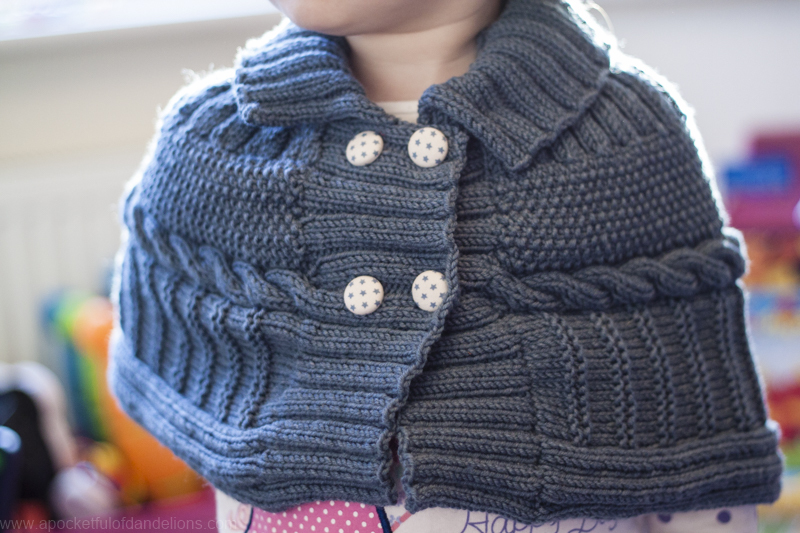 The capelet has a really interesting construction; you knit the body vertically and then pick up stitches along one long edge to form the yoke before knitting the button bands and collar. Bubs loves it but I think that has more to do with it looking like something Elsa and Anna would wear rather than any appreciation of the time, energy and love I’ve put into every stitch. For now it keeps the chill off her shoulders when we’re indoors playing endless games of ‘follow the leader’ but come the spring it will be great on those days where it’s too warm for a coat but not quite warm enough for bare arms. Speaking of spring I’m already planning ahead and bookmarking patterns for short-sleeved tops and pretty dresses knit in cotton yarns. And, ok yes, there may be a sun hat or two as well. She’s definitely knows her own mind that’s for sure. As far as knitting goes, with practice you won’t need to look at your needles unless you’re knitting something really complicated. I can knit and watch telly or YouTube. I look down more when I’m blogging than I do when I’m knitting. Oh it’s stunning! and it looks so warm and snuggly! Lucky girl, I hope she loves it. And you’re not the only one with more knitting plans than time! !